19 year old Mike Mokamba’s dream to represent the country at the highest level is a few days away from becoming a reality after he qualified as the only 200m athlete for next week’s IAAF world championships in Moscow Russia. The athlete clocked a time of 20.50 to win his semi-final before returning to the tape with a triumphant 20.60 in the final at the National Championship last month. His time was within the A standard requirement for the world championships. Mokamba sacrificed rugby for athletics with a strong influence from his father, who also doubled in the 4x100m at the 1988 Olympics. He played for Terige High School as a winger and would represent Rift Valley at the 2011 Safari Sevens. “I used to be a rugby player up to the national stage while at high school. Rugby was my number one passion where I had planned to venture deep after my secondary school education but my dad had different plans encouraging me to take up sprints.” Recalls the former winger. He did not compete in 200m during the World Junior Championships in Barcelona after what he termed as poor communication between Kenya’s AK and IAAF officials. 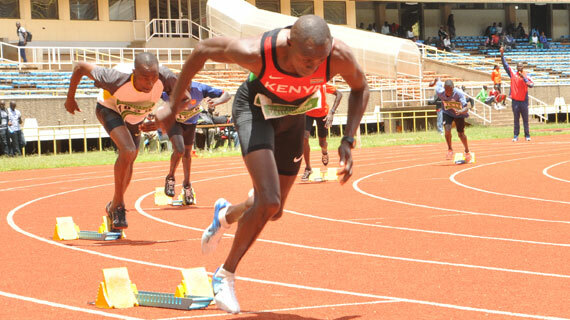 The son to Elkana Nyangau, who was in the 4x 400m relay team that competed at the 1988 Olympics, says he is not moved by the prospect of being the only Kenyan in the race. “I am ready to run with the best in the world. Believing in myself has been the greatest motivation. In Moscow I want to give my best Shot.” He added. However, 200m will not be the only agenda for Mokamba as he is a key member in the 4x400m team. It comprises of the world junior bronze medalist Alphas Kishoyian, Moses Kipkorir Kerich, Boniface Mweresa, Vincent Kosgei and Boniface Mucheru. “This is a solid young team, we have been training together helping each other in all areas. I can foresee a medal from this team.” affirms the regular starter at the relays. “My dad who was a sprinter in the past has been there for me encouraging, coaching and advising me to become better than him.” He concludes. Jamaica’s Usain Bolt recorded the fastest time of the year in the 200m at the Diamond League meeting in Paris early in July when he clocked 19.73 seconds to beat fellow Jamaican Warren Weir (19.92) and France's Christophe Lemaitre (20.07).